Blue Banana Entertainment possesses a proprietary set of skills and experience acquired over more than 40 years of successful international show production. Our métier and skills: envision, development, draft, design, compose, visualise, produce, direct, perform and manage. 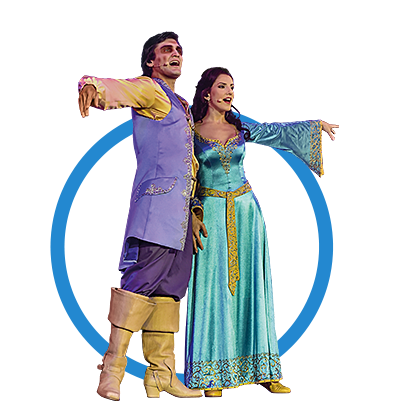 This culminates in fantastic shows on stages small and large, in front of the most diverse audiences across the globe. Blue Banana Entertainment designs the show together with you, produces the show exclusively for you and brings the show to your doorstep – while never forgetting all the things that go with it. The range of services comprises creation (story, costume design, directing, choreography), production (tailoring, stage design, sound/light/event technology, special effects) as well as organisation and logistics. Including performances at locations and times of your choice. „Blue Banana Entertainment“ provides a huge variety of different show-types to suit every customers requirements. 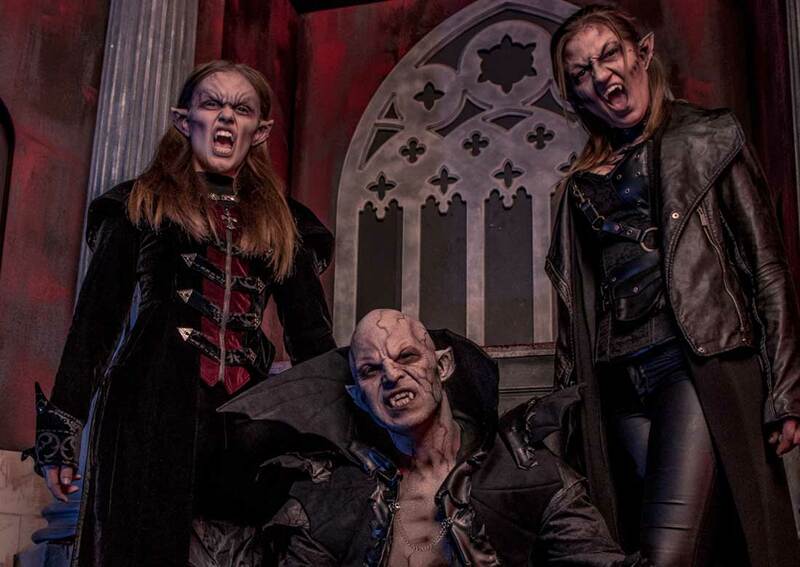 Blue Banana Entertainment’s portfolio comprises shows for every target age group, for all seasons, and for the most varied occasions, events and show locations. All of them favourites with the audience: Eddas Castle Show, huge interactive fun for little guests with plenty of music and dance; Happy Family Show, the wonderfully enchanting adventures of the Wishbone family: Following the worldwide release of the 4D Happy Family animation movie, we now bring you an interactive live adventure for all the family. Featuring all the characters you know and love in a show for all the family to enjoy. Great costumes, catchy music and fantastic special effects, it’s a real roller coaster ride bringing you closer to the action than ever before. Don’t just watch the action, live it. Blue Banana Entertainment designs and produces – completely in-house – ready to go, live-tested show projects for companies and event hosts. For the love of our work. Perfection down to the smallest detail. Experience stemming from numerous productions. A feel for the latest trends and innovation. A talent for perfect entertainment. The courage for new ideas. A great connection with the audience. Committed to your interests. Get in touch with us – we look forward to your challenge! 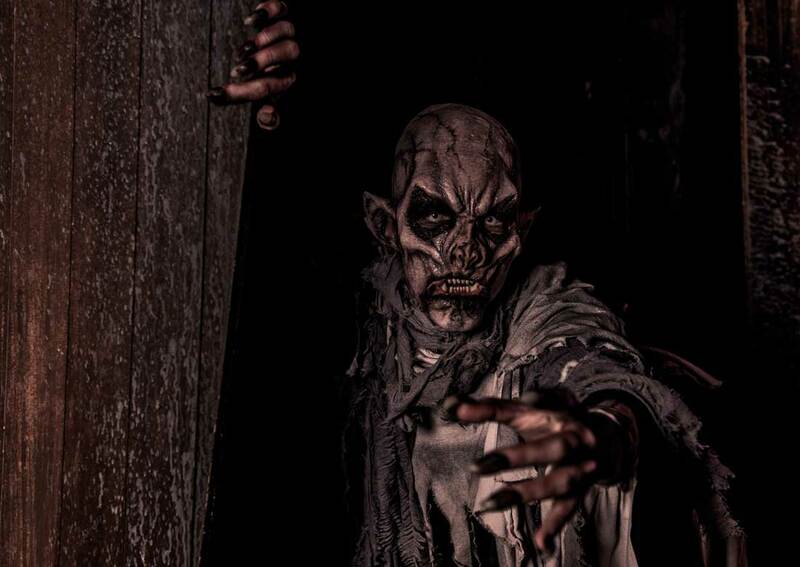 Award winning haunts, realistic sfx makeup and the highest interaction horror events have ever seen. 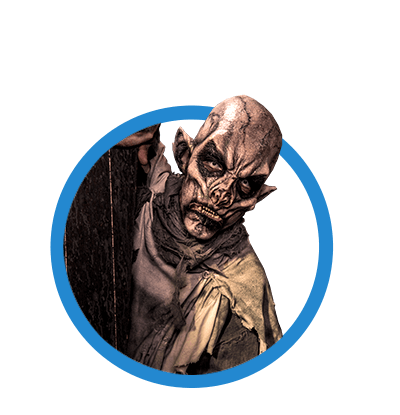 Haunts for all ages, different scare levels possible. A world after the apocalypse. 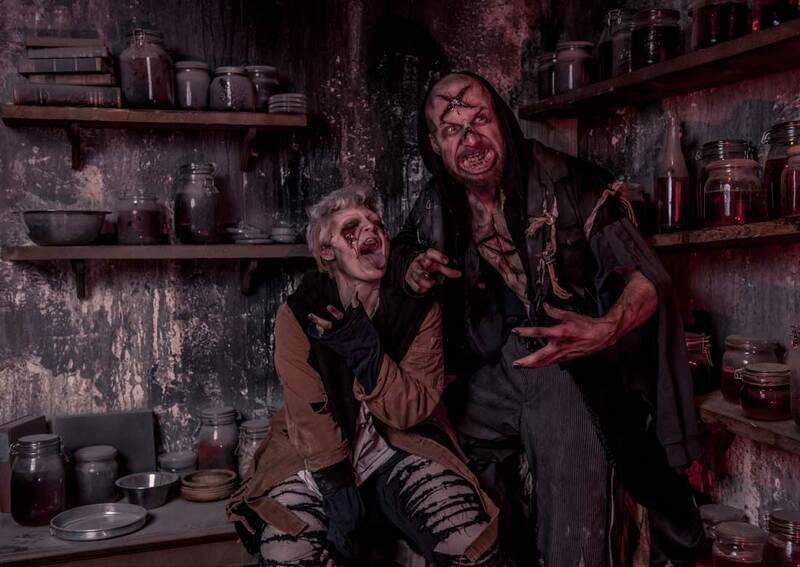 This immersive horror experience brings guests to their own horror movie. 5 factions live in this world with its own rules. On our website, we use Google Analytics with the suffix „_gat._anonymizeIp“. In this case, your IP address will be truncated by Google within the Member States of the European Union or in other countries that are party to the Agreement on the European Economic Area and thereby anonymised. Mack Media GmbH & CO. KG (hereinafter „the Provider“) does not assume any liability for the topicality, correctness, completeness or quality of the information provided. Where the Provider provides any direct or indirect references to external websites („links“), the Provider shall only be liable if he is specifically aware of the content, and it is technically feasible and reasonable for him to prevent the use where a website contains illegal content. 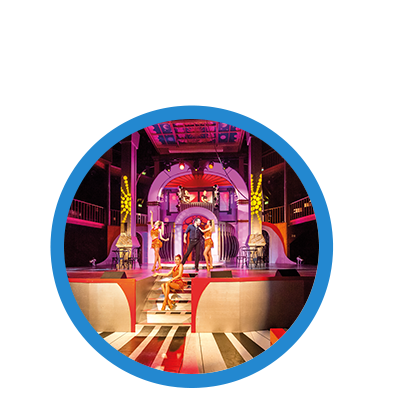 The perfect combination of culinary perfection and artistic entertainment, with enthralling shows combining art, cabaret and magic. 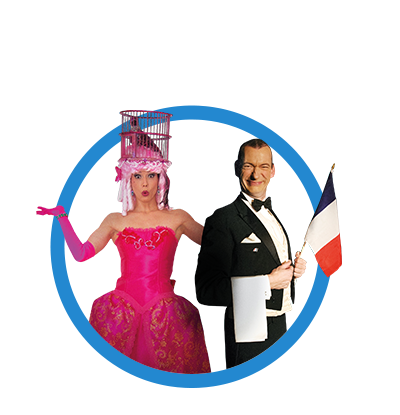 This dinner show is set as an exclusive cruise: The festive 2-star menu is a magical journey of culinary luxury. Also on board: The longing to see the big wide world. A colourful combinationof magic, full of spectacular surprises and highlights. The audience reaches its own, far-flung goal – the harbour of dreams. The fabulous production of the story of a girl named Lilly, who fearlessly and unsuspectingly enters the haunted castle of King Borbar – but nothing is like it was after the first haunt. This spooky show takes its audience with ease into the mystical world of ghosts, witches, fairies and elves. The haunted performance is transformed into a unique symphonic experience thanks to the suspenseful music brought to you by the composer Hendrik Schwarzer and the author Jan Lepold – gruesomely good entertainment! The ‘Globe Theatre’ has been recreated after the London theatre famed for premiering and celebrating the successes of the works by William Shakespeare in Elizabethan times. Even today, this stage is part and parcel of the entertainment. 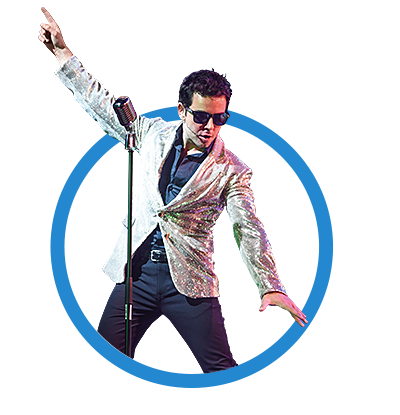 Experience world-famous musicals with stunning dance routines and thrilling songs, which together blur the boundaries between stage and audience: Take Elvis for example, the ‘King’ and first mega star whose hits kicked off the golden era of rock‘n’roll and went on to define generations thereafter. Horror is heavenly – as long as it stays on the stage. 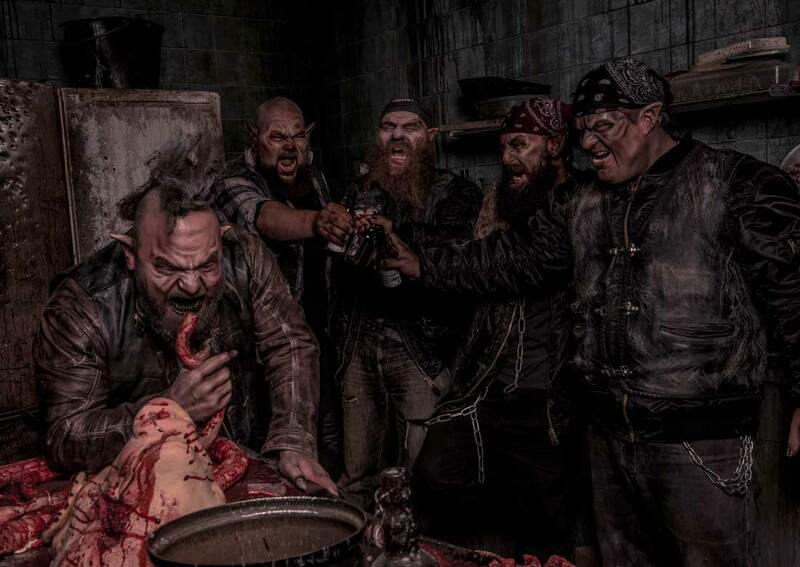 The terror is tangible – when the show captivates the audience. 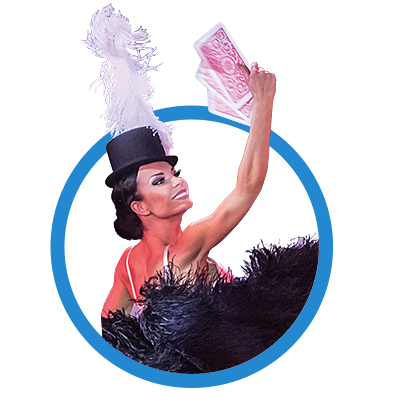 Cabaret – the stage show classic: A varied programme consisting of acrobatic, magical, dance and musical acts, brought together by a brightly coloured mosaic. Background story to this cabaret show: A deck of cards mysteriously comes to life, an eerie Joker mixes the deck. It is a game with no certain end. Clubs and diamonds engage in acrobatic battles, the black and red cards dance together frantically, and the Jack of Spades lifts the Queen of hearts through the air… Is there a fairytale ending in sight? Fast-paced entertainment on ice: Every ice show is defined by the typical athleticism, rhythm and elegance you can only find on ice. The conditions are always the same: The ‘floor‘ is perfectly polished ice. The stories take on different forms: Surpr´Ice with the son of Santa Claus, Surpr’Ice in the Haunted Castle, Surpr’Ice with the Magical Angels – and the exciting question is always: Will there be a happy end again? Costumes are among the secret stars: They lure the audience into different worlds, eras and atmospheres of the show. 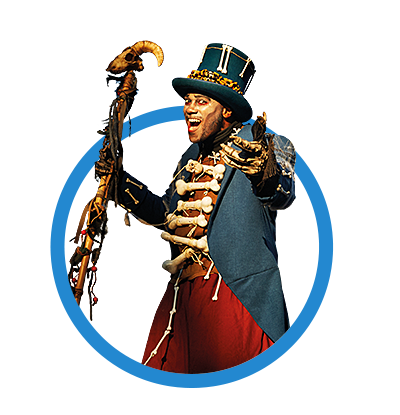 Blue Banana Entertainment has everything in-house for a ‘tailor-made‘ show in every sense: A large selection of the most eccentric costumes, an enormous range of the most varied fabrics and utensils – and above all our own studio with fashion designers and costume tailors. Stage design is characterised by the conflict between creation and safety. Any design demands fantasy, but its implementation necessitates many years of specialist knowledge. After all, it’s not just the show that takes centre stage, but also the safety of audience members and performers alike. The in-house team at Blue Banana Entertainment knows no compromise: The priorities governing creation and safety are exactly the same – they are always number one. The in-house team of Blue Banana stage experts are able to achieve the perfect interplay between the two: Spectacle on the stage, an excited audience in front, and safety all around the stage! Sound and lighting technology is the constant companion for every show. Whether it’s playing a discreet role in the background, or as the protagonist at ‘centre stage‘. Entertaining an audience requires professional equipment and our team’s expertise that can only be acquired in show business. The experience we have acquired from more than 10,000 shows a year on stages of all different shapes and sizes has afforded us the necessary expertise to create the perfect sound and light installation every time. Our experts can identify weak spots in existing infrastructure, and can offer individual solutions quickly if needed. Technological advances are among the driving forces in modern entertainment especially within show business. 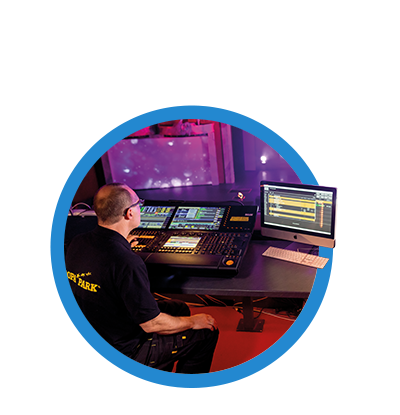 Blue Banana Entertainment knows, understandsand uses the entire scope of technical stage effects – and appreciates just how the very latest technology can be used to its full potential. 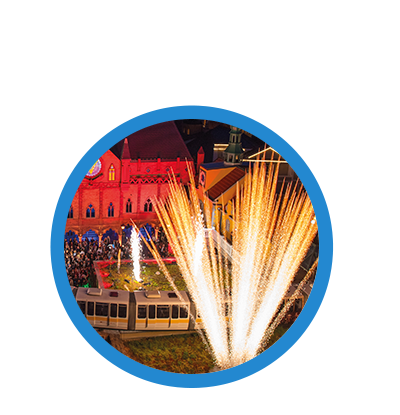 For decades our work has been distinguished by its highly skilled and artistic use of pyrotechnics, fire and water. 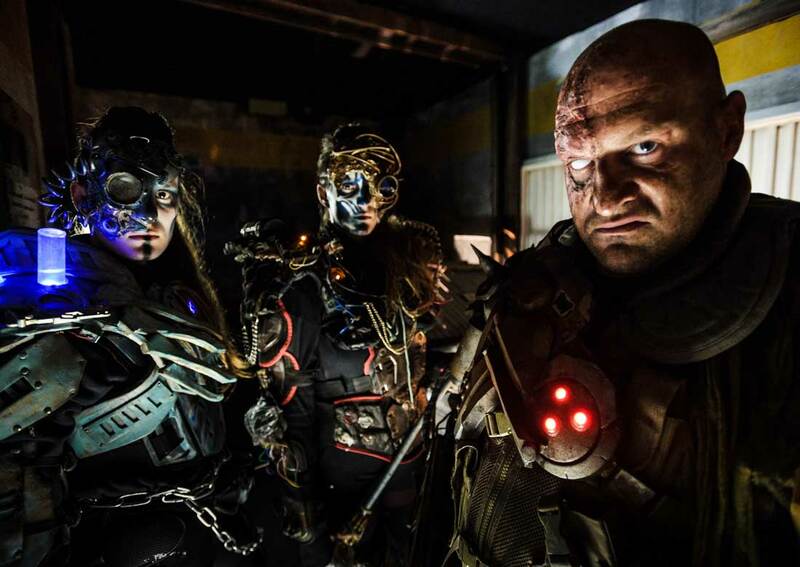 Our team’s experience, the diversity of our own métier, our technologically advanced equipment, the professionalism of our studio, our management expertise, the unique combination of all these success factors – in-house at Blue Banana Entertainment – allows us to deliver and perform spectacular shows designed according to specific customer wishes, within the shortest space of time. By continuing to use our site, you accept our terms and conditions.